The best exercise warm up routine is to do the same activity as the intended workout. However, we should do the workout at a slow pace and low intensity for the first 5-minutes. Over the 5-minute period, we should slowly increase our speed and intensity to workout levels. The pace of all our workouts should be slow-fast-slow. At the end of the workout, we should not completely stop the activity. We should slow down our pace and intensity over a 5-minute cool down period. Once we are finished with the cool down period, our body is ready for a flexibility workout. Our muscles are still warm and flexible, and are least likely to be injured by a flexibility routine at this point. We should do all flexibility workouts slowly and never to the point of discomfort. We should try to hold each position for 8 to 10 slow breaths. 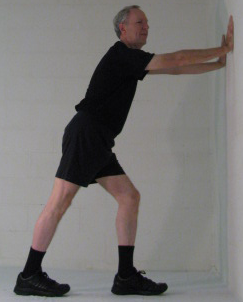 This activity really helps to stretch the calf muscle. If you let your head and shoulders hang loosely down toward the ground, you will find that this activity relieves tension in your neck and shoulders. This routine also will stretch your back and hamstring muscles. I love doing this activity to stretch out my lower back muscles. It really does help relieve lower back tension. 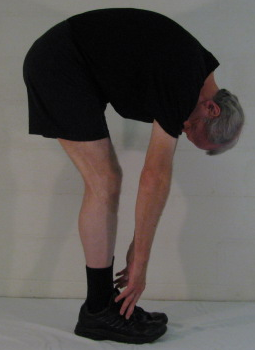 Use the same procedure as the Single Leg Stretch except lift both legs at the same time.